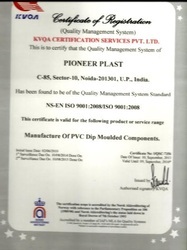 Pioneer Plast, incepted in the year 2007, is an ISO 9001: 2008 Certified Company, has earned the reputation of being one of the leading manufacturers, suppliers and exporters of a commendable range of PVC Bellows & Moulded Components. The offered range is inclusive of PVC Bellows, PVC Dip Moulded Components and Vinyl Coating Components is known as the finest available in the market. These components, provided by us in the market, are highly praised for their flexibility and long life. Along with this, our efficient and client-centric work practices have helped us generate a huge client base. Pioneer Plast is widely known for offering quality products, owing to its state-of-the-art infrastructural facility. This facility is known to be one of the finest in the nation. It helps in enhancing the efficiency and overall productivity. With the dedicated help from our hard working professionals, we have been able to maintain a standardized production process. In order to provide the best to our clients, we send the final range of components for a number of quality checks to ensure their flawlessness. Under the guidance of our manager "Mr. Umesh pokhriyal" we have managed to add several success stories to our list. His understanding of the domain and the ability to make quick decisions have been our assets. Further, his will to develop the firm has given its employees a huge learning platform. We export our product All Over The World. We owe the success of Pioneer Plast to our team of employees, who work efficiently and dedicatedly to achieve the goals and objectives of the organization. These professionals are hired on the basis of their skills and achievements. Their valuable inputs and working standards have helped us in increasing our productivity and minimizing the cost. We consider providing quality to our clients as something of high importance. Thus, the manufacturing of the components is done using the finest quality raw materials and modern machines. Post manufacturing, the products are sent to our team of quality analysts, who, with high efficiency, scrutinize and eliminate any kind of defects. Quality, of the products we offer, is checked on various parameters. Our highly modernized state-of-the-art infrastructural facility is considered to be one of the finest that is available in the market. The facility comprises of high tech machinery and advanced technology, that is helps in boosting our productivity, improve quality, and facilitate R&D. Further, our infrastructure is divided in several units, for the purpose of achieving smoother operations. Since our inception, we are known as a client-centric firm. Thus, all our operations are carried out keeping in mind the client’s needs. Our production involves using of the finest raw materials and modern machinery that are available in the market. Post manufacturing, we process the components through a number of quality checks, to assure the flawlessness of the final range. Further, we price all our products in the best possible way and provide prompt delivery as well.